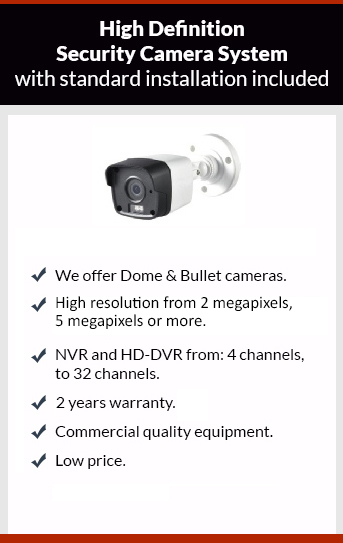 Get affordable Security Camera installation on Paramount, CA and CCTV equipment with commercial quality and 2 years warranty. We have been working in Paramount, since 2005; we offer professional installations with a low price. If you live in a fairly safe area probably you don’t have in mind to buy a security camera system. You haven’t heard about any crimes on your neighborhood, until something happens. Like it or not everybody is exposed to some kind of crime. You read about crime every day online, and it seems that most of the times a security camera system is used to identify and arrest the suspect. To feel and get safe, you can decide to get a security camera for your home or business. The good news is that you have a lot of options, the only problem that you will have is to choose one among several providers and different surveillance camera technologies. If you don’t have too much light around your home at night you’ll have concerns about the video recording of the cameras at night, crimes have a tendency to occur after dark. You will learn that a low cost infrared security camera will give you nigh vision only to 20 or 20 feet’s, by contrast high end or commercial quality cameras will give you 60 to 85 feet’s with no problems. The video clarity in a surveillance camera system is really important; the clarity of the video is related to the video definition of the security camera. Clearer, the better. The clarity of the picture was a big issue a few years ago when the video resolution was measured in TV-Lines at that time the video of the surveillance cameras was not really clear. With the new technologies high definition (1080p) surveillance cameras are common. The equivalence on pixels for 1080p is 2 megapixels, for 4K resolution is 4 megapixels. High definition cameras are good news for law enforcement to identify suspects. You can choose Protection4less to be sure that you are going to get the right camera at the right price for you. After a visit at your home or business we’ll submit a detail proposal with the best camera at the best price.